I haven't made art in a while. I got sucked into the Olympics. Hard. I may have even gained the 4.2 pounds that the average Brit piled on over that two week period. While I'll always be a sucker for figure skating, I love the summer games more. 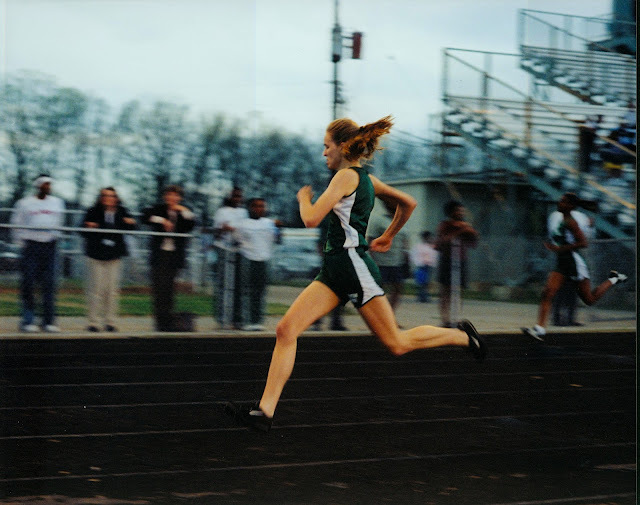 I ran track for 8 seasons and participated in a summer swim team for many years. That's me in that picture in my faster, fitter days. It's been a while since I packed my body into those start blocks and nervously waited for the gun to go off, but I got a little of that adrenaline rush watching the swimmers and runners. I couldn't stop -- race after race and heat after heat. I even skipped going out with some friends to stay in and watch the women's gymnastic team win gold for the first time since Atlanta in '96. I watched the Magnificent Seven win while flopped on my belly in front of the TV at my grandparents' 16 years ago, and dammit, I was going to see it happen again. So now I've seen it all. Even the Spice Girls reunion atop bedazzled, black taxis. Now, It's time to get back on track, and to return to regularly scheduled programming.